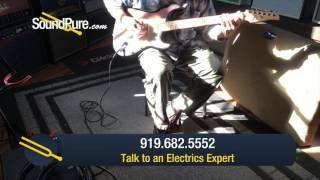 Variable 22W or 44W settings, reverb and effects loop! 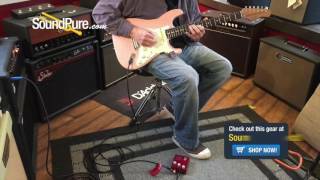 Suhr's ultimate American-voiced portable pedal platform now available as a head! Payments as low as $49/mo. Or, apply & pay as little as $49/mo. 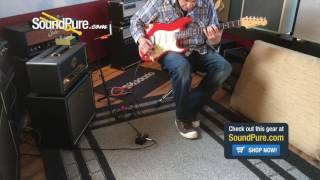 In this video, Sound Pure guitar specialist Eddie Berman tests out the Suhr Classic JM Pro Olympic White Electric with a Suhr Bella Reverb Head, a Suhr Bella 1x12 Cabinet and a Vertex Dynamic Distortion Pedal. 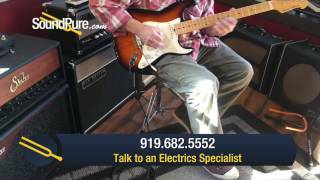 In this video, Sound Pure electric guitar specialist Eddie Berman tests out the Tuttle Custom Classic T 3-Tone Sunburst #13 (Used) with a Suhr Bella Reverb Head, a Suhr Bella 1x12 Cabinet and a Strymon Brigadier dBucket Delay Effect Pedal. 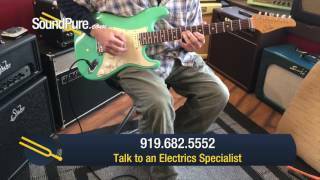 In this video, Sound Pure electric guitar specialist Eddie Berman tests out the Suhr Classic Sea Foam Green Brazilian FB SSS #3347 (Used), with a Suhr Bella Reverb Head, a Suhr Bella 1x12 Cabinet and a Vertex Steel String Clean Drive pedal. 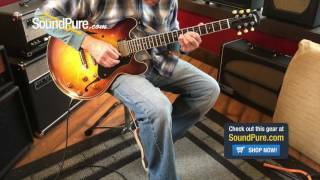 In this video, Sound Pure electric guitar specialist Eddie Berman tests out the Collings I-35 LC Aged Tobacco Sunburst w/ ThroBaks #16843 with a Suhr Bella Reverb Head, a Suhr Bella 1x12 Cabinet (Black) and a Suhr Eclipse Dual Channel Overdrive/Distortion Pedal. 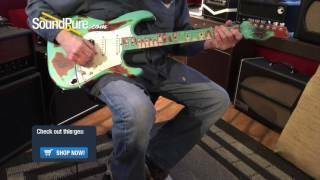 In this video, Sound Pure electric guitar specialist Eddie Berman tests out the Suhr Standard Ltd. 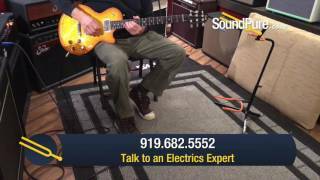 Edition Archtop Aged Cherry Burst (Used) with a Suhr Bella Reverb Head, a Suhr Bella 1x12 Cabinet and a Strymon El Capistan dTape Delay Effect Pedal. 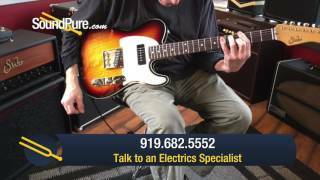 In this video, Sound Pure electric guitar specialist Eddie Berman tests out the Suhr Custom Classic T "Like Mike" 3TB Electric #JS2H7E with a Suhr Bella Reverb Head, a Suhr Bella 1x12 Cabinet and a Strymon El Capistan dTape Delay Effect Pedal. 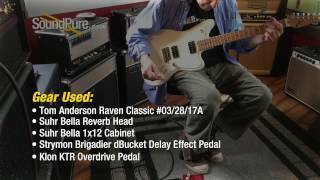 In this video, Sound Pure electric guitar specialist Eddie Berman tests out the Anderson Raven Superbird Trans Cherry #07-23-16A (Used) with a Suhr Bella Reverb Head, a Suhr Bella 1x12 Cabinet, a Jetter Gear David Grissom Signature Overdrive Pedal, and a Strymon El Capistan dTape Delay Effect Pedal. 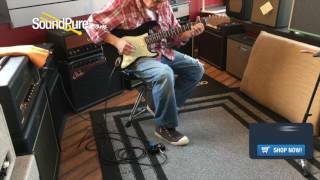 In this video, Sound Pure electric guitar specialist Eddie Berman tests out the Suhr Custom Classic Antique "Like Mike" 3TB SSS #31664 with a Suhr Bella Reverb Head, a Suhr Bella 1x12 Cabinet, a Strymon El Capistan dTape Delay Effect Pedal and a Vertex Dynamic Distortion Pedal. 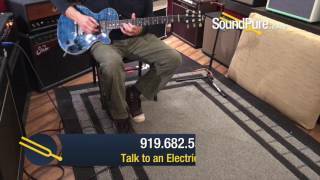 In this video, Sound Pure electric guitar specialist Eddie Berman tests out the Tyler Studio Elite HD Black Schmear HSS Guitar #16237 with a Suhr Bella Reverb Head, a Suhr Bella 1x12 Cabinet, an Xact Tone Solutions Imperial Overdrive Guitar Pedal, and a Strymon El Capistan dTape Delay Effect Pedal. 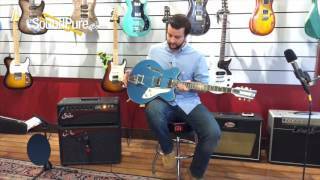 In this video, Sound Pure electric guitar specialist Matt Anthony tests out the Duesenberg Fullerton Elite Catalina Blue Semi-Hollow #150919 with a Suhr Bella Reverb Head, a Suhr Bella 1x12 Cabinet, an Xotic Effects Allen Hinds Soul Driven AH Effect Pedal and a Shure KSM313/NE Dual-Voice Ribbon Mic with Roswellite Ribbon. 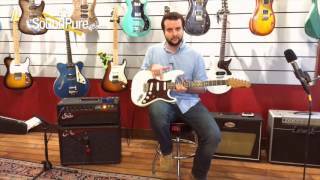 In this video, Sound Pure electric guitar specialist Matt Anthony tests out the Michael Tuttle Tuned S Olympic White SSS Electric #414 with a Suhr Bella Reverb Head, a Suhr Bella 1x12 Cabinet an Xotic Effects Allen Hinds Soul Driven AH Effect Pedal, and a Shure KSM313/NE Dual-Voice Ribbon Mic with Roswellite Ribbon. 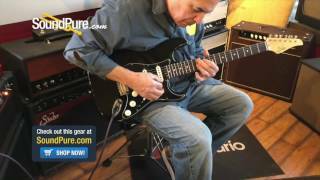 In this video, Sound Pure electric guitar specialist Eddie Berman tests out the Suhr Custom Classic Antique Black #10872 with a Suhr Bella Reverb Head, a Suhr Bella 1x12 Cabinet and a Strymon Brigadier dBucket Delay Effect Pedal. 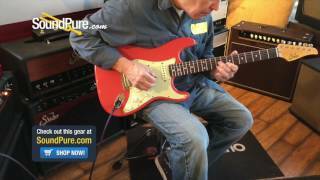 In this video, Sound Pure electric guitar expert Eddie Berman tests out the Suhr Custom Classic Antique Fiesta Red SSS IRW #31515 with a Suhr Bella Reverb Head, a Suhr Bella 1x12 Cabinet and a Strymon El Capistan dTape Delay Effect Pedal. 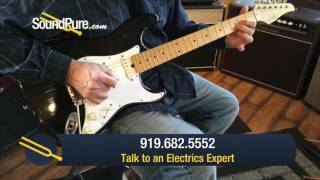 In this video, Sound Pure electric guitar expert Eddie Berman tests out the Suhr Custom Classic Antique Black SSS IRW Light Aging Electric #31516 with a Suhr Bella Reverb Head, a Suhr Bella 1x12 Cabinet and a Strymon El Capistan dTape Delay Effect Pedal. 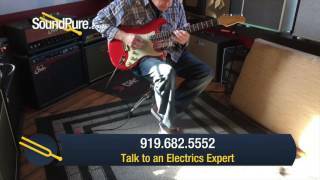 In this video, Sound Pure electric guitar expert Eddie Berman tests out the Suhr Classic T Antique Trans White HH Roasted #31457 with a Suhr Bella Reverb Head, a Suhr Bella 1x12 Cabinet, a Strymon Brigadier dBucket Delay Effect Pedal and a Vertex Dynamic Distortion Pedal. 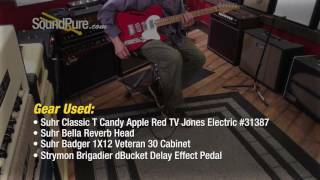 In this video, Sound Pure electric guitar expert Eddie Berman demonstrates the Suhr Classic T Candy Apple Red TV Jones Electric #31387 with a Suhr Bella Reverb Head, a Suhr Badger 1X12 Veteran 30 Cabinet, and a Strymon Brigadier dBucket Delay Effect Pedal. 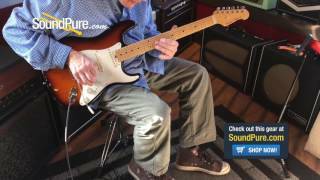 In this video, Sound Pure electric guitar expert Eddie Berman tests out the Anderson Icon Classic Satin Tobacco Burst Guitar 10-05-15P with a Suhr Bella Reverb Head, a Suhr Bella 1x12 Cabinet and a Vertex Dynamic Distortion Pedal. 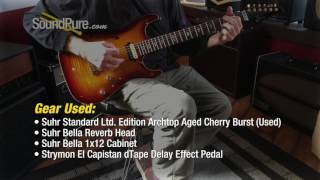 In this video, Sound Pure electric guitar expert Eddie Berman tests out the Michael Tuttle Tuned S Fiesta Red SSS Electric #412 with a Suhr Bella Reverb Head, a Suhr Bella 1x12 Cabinet, a Strymon Brigadier dBucket Delay Effect Pedal and an Xact Tone Solutions Imperial Overdrive Guitar Pedal. 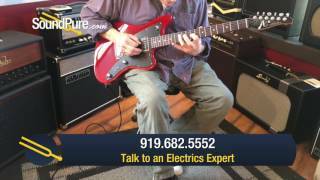 In this video, Sound Pure electric guitar expert Eddie Berman tests out the Michael Tuttle Tuned S Fiesta Red HSS Electric #413 with a Suhr Bella Reverb Head, a Suhr Bella 1x12 Cabinet and an Xact Tone Solutions Imperial Overdrive Guitar Pedal. 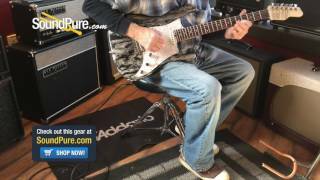 In this video, Sound Pure electric guitar expert Eddie Berman test out the Michael Tuttle Custom Classic S Black HSS IRW #411 with a Suhr Bella Reverb Head, a Suhr Bella 1x12 Cabinet and an Xact Tone Solutions Imperial Overdrive Guitar Pedal. 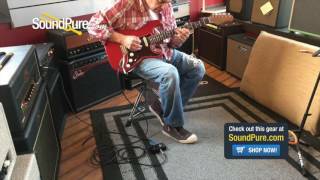 In this video, Sound Pure electric guitar expert Eddie Berman demonstrates the Suhr Classic Antique Dakota Red HSS IRW #31331 with a Suhr Bella Reverb Head, a Suhr Bella 1x12 Cabinet, a Strymon Brigadier dBucket Delay Effect Pedal and an Xact Tone Solutions Precision Multi-Drive Guitar Pedal. 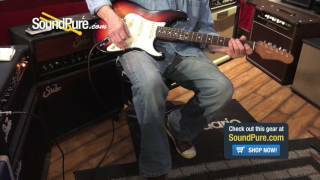 In this video, Sound Pure electric guitar expert Eddie Berman demonstrates the Suhr Classic Antique Black HSS IRW #31330 with a Suhr Bella Reverb Head, a Suhr Bella 1x12 Cabinet, a Strymon Brigadier dBucket Delay Effect Pedal and an Xact Tone Solutions Precision Multi-Drive Guitar Pedal. 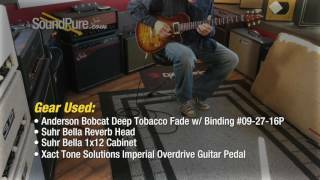 In this video, Sound Pure electric guitar expert Eddie Berman tests out the Anderson Bobcat Deep Tobacco Fade w/ Binding #09-27-16P using a Suhr Bella Reverb Head, a Suhr Bella 1x12 Cabinet, and an Xact Tone Solutions Imperial Overdrive Guitar Pedal. 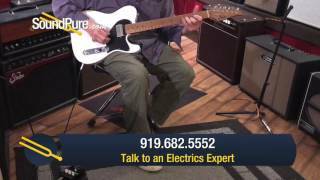 In this video, Sound Pure electric guitar expert Eddie Berman demonstrates a used Suhr Classic T Extreme Antique. 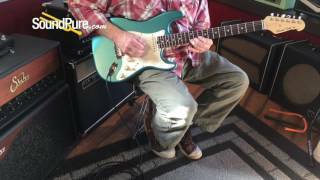 Other gear used in this video includes a Suhr Bella Reverb Head, a Suhr Bella 1x12 Cabinet, an FX Engineering RAF Mirage Compressor Effect Pedal and a Xotic Effects USA SL Drive Overdrive Effect Pedal. 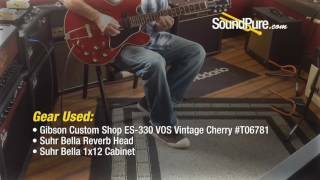 In this video, Eddie Berman tests out a Gibson Custom Shop ES330 VOS using a Suhr Bella 1x12 Cabinet, and a Suhr Bella Reverb Head. 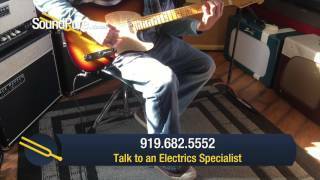 With the introduction of spring reverb in the 1960s, guitarists were inspired to create new genres of music. From the California surf scene, to nashville twang, the smokiness of motown, to the bite of english blues. Even today, 50 years later, with modern technology, there is still nothing quite like the rich, lush character of a spring reverb. 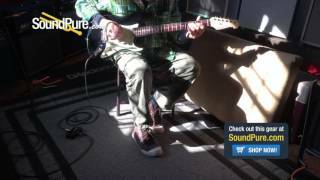 Reverb has inspired guitarists to create space, depth, dimension and ethereal soundscapes, transforming and elevating the guitar to another level of musical expression. 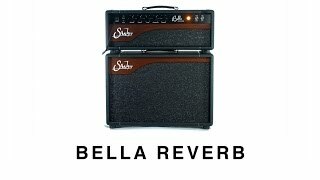 Inspired by the classic sounds of yesterday, the Bella Reverb brings together all of the convenience and features of our original Bella amplifier with the addition of a unique tube spring reverb circuit. 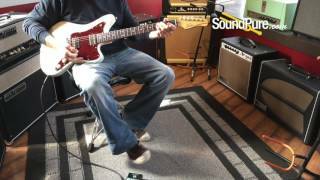 This circuit was painstakingly designed to offer players the ultimate reverb experience without coloring or altering the sound of Bella, or your instrument’s natural tone. Bella is a portable, American voiced, hand-wired, all-tube amplifier. Bella is designed to be the ideal grab-n-go amplifier and the ultimate platform for your pedalboard. Bella’s simple and easy to use controls (including Boost and 3-position Bright switch) make it a snap to tailor the amp to your favorite boost, overdrive, fuzz and distortion pedals; while the effects loop is the ideal place for all of your chorus, flange, delay, and reverb pedals. Bella is powered by a duet of 6L6GC power tubes that deliver either 22 or 44 Watts of Class A/B power. 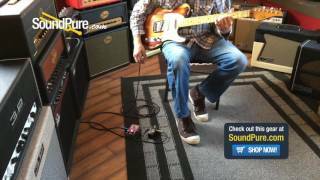 Effects Loop: Tube-driven, buffered, with independent send and return levels.